Some pairings just make sense. Peanut butter and jelly. Cookies and milk. You just can’t enjoy one without the other. Unfortunately, not everyone has a secluded place to situate their new hot tub. But everyone can create a little extra hot tub privacy with these creative ideas. One of the best ways to create privacy around your hot tub is by adding a little green. When it comes to plants, the possibilities are virtually endless. Trees, bushes, flowers and plants can all be used to create as much privacy as you need. These living privacy screens also offer gorgeous landscaping around your tub and a beautiful view. It’s truly a win, win. When using plants around your hot tub, there are a few special considerations. You’ll want to consider the growing season and climate requirements for the plants that you’re using. You’ll also want to make sure that the plants don’t put off too much debris, so you don’t give yourself any added work. Privacy screens are also a great option. The screens are portable, so you have the option of changing up your space. You can have privacy when you want privacy, but you can also move the screens around if you want a more open feel. Often, hot tub owners use their spas for multiple purposes. You may want privacy for your nightly soak, but need a more open feel while you host a party or get together. Privacy screens can also be used to help block the sun, which is definitely an added benefit here in Texas. Spa umbrellas offer many of the same benefits of a privacy screen. They’re portable and can be used to screen whichever area is needed at the time, but they take up less space on your patio or deck. Spa umbrellas can offer a degree of privacy then be closed or removed when they’re not needed. A spa umbrella does have a better angle for sun protection, but may not offer quite as much privacy. A quick look at Pinterest or Houzz will turn up countless images of pergolas with beautiful flowing curtains. Not only are they a stylish design addition to your backyard, they’re a perfect way to create privacy for your hot tub. This option is versatile, too. You can open or close the curtains for whatever mood you are trying to create. While you’re browsing you might also stumble upon some great faux wall options. These walls can section off areas of your outdoor space, much like walls in your home. They can be movable or semi-permanent. The best part about these faux walls is that they can built to suit your needs and design tastes. Creating privacy around your hot tub doesn’t have to be difficult. These ideas are simple, beautiful and functional. 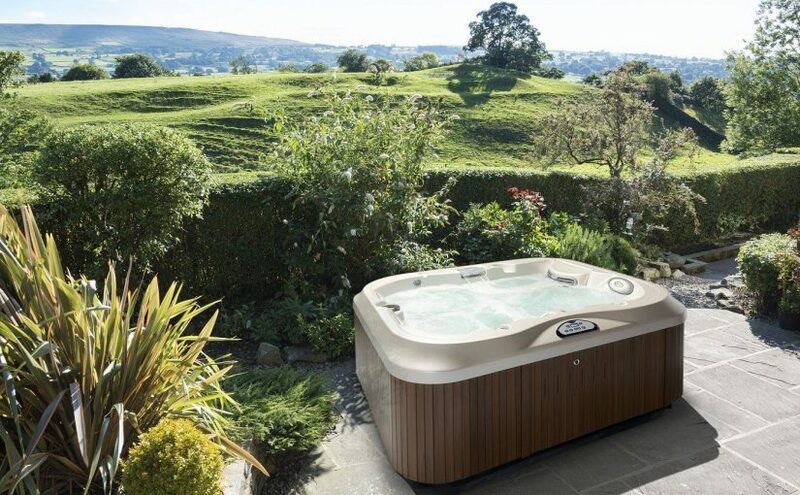 A hot tub is a big investment, ad we want you to be totally satisfied with every aspect of your purchase. If you have any questions about adding privacy don’t hesitate to ask. Happy soaking!